In what seems to be the first pilot test of One Laptop Per Child laptops in-country, The Nation reports that Thailand's Caretaker Prime Minister Thaksin Shinawatra announced his country will take delivery of 530 laptop prototypes in October and November. Thaksin used his weekly radio address to make the announcement, promising the laptop computers will be tested in remote schools. No word if Thailand is purchasing these laptops or what price it might be paying if it did. "It is a floating price. We are a nonprofit organization. We have a target of $100 by 2008, but probably it will be $135, maybe $140." Then what would these go for Mr. Negroponte? Pre-release betas are usually free, with early adopters paying the highest price. Also, this suggests that OLPC is confident they will have production-ready laptops by November. 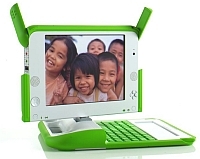 Might OLPC's look like this? And who else will be announcing pilot tests now? A 500 unit test in one country is a very small pilot when we're talking millions of units on a global scale.